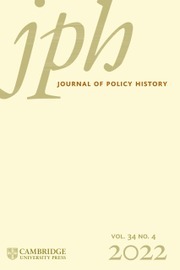 The Journal of Policy History is an interdisciplinary journal concerned with the application of historical perspectives to public policy studies. While seeking to inform scholars interested in policy history, the journal also seeks to inform policy makers through a historical approach to public policy. Its authors, considering public policy primarily in the United States though also in other nations, focus on policy origins and development through historical inquiry, historical analysis of specific policy areas and policy institutions, explorations of continuities and shifts in policy over time, interdisciplinary research into public policy, and comparative historical approaches to the development of public policy.